Hi everyone! Now that spring is apparently here (not so much here in New England where we are expecting more snowflakes) it is time to start thinking about your lawn and garden again in order to get that beautiful landscape that we all want! Now, I’m not an expert gardener by any means and no one has ever accused me of having a green thumb. However, I do try to keep my lawn and garden in decent shape. Over the past few years, these tips have certainly helped me move things in right direction. If you don’t have a sprinkler system invest in a timer. In the heat of the summer, the last thing you need is to forget to water your flowers and lawn. Or, like we once did, go on vacation for a week and come back to an entire dead, yellow lawn. Epic fail. Check out the whole post on my DIY sprinkler system here! In our first house, we had three hoses. One for the front, one for the back and one for the side yard. Each hose is attached to a sprinkler and on a timer. Instant sprinkler system! If you’re like me and won’t remember to water your lawn every day then this is absolutely necessary to keep your grass nice and green! The same goes for watering your flowers. I like to set my timer for early in the morning – say 5am. That way the water has time to soak in and not evaporate in the mid day heat. Also, it’s early enough that most people are not going to work yet so you won’t soak your neighbor! It’s a good idea to avoid watering your lawn, in particular, in the evening. The water won’t have time to evaporate off and may cause the rapid grow of fungus. 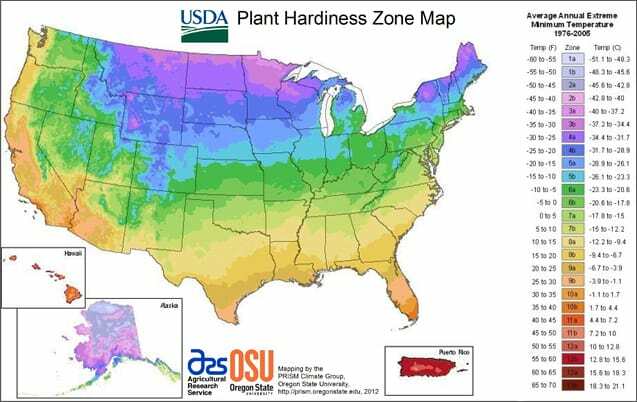 Know your USDA Hardiness Zone. This is very important to make sure that any perennials, trees or shrubs that you plant will survive in your area (usually whatever is sold at your local garden center will be appropriate for the locale). In New England, for instance, plants need to be able to survive hot summers and frigid winters. If you live in the South West, you will be focused more on plants that are drought tolerant. Before planting anything take a few days to plan. Pay particular attention to the type of sun each area of your yard gets. Plants designated “full sun” will need a minimum of 8 hours sun, where sun/shade plants will do better with just morning sun. I’ve killed many a plant by giving it too much sun so plan, plan, plan! Reseed your lawn and use fertilizer in the spring and fall to keep your grass strong and healthy. Use The Best Weed Killer – And it’s Natural! 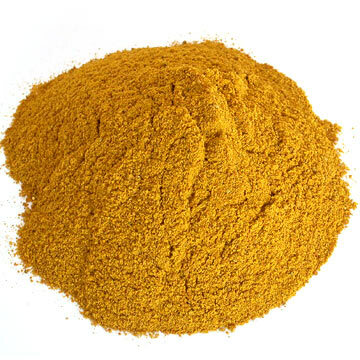 Naturally prevent weeds using Corn Gluten Meal (buy it here). Activate it with water and it’s good to go for 5 or 6 weeks. You can find it at any health food store. One of my husband’s friends swears by this and his lawn is beyond perfect. This is something we will be doing this spring, too. As a bonus, it’s natural and safe. I hate the idea of my son rolling around on grass that’s covered with chemical weed killers. When mowing your lawn, only remove to the top 1/3 of the grass. Longer grass is stronger grass. If you like to “reorganize” or move your plants around frequently, consider planting them IN their pots. When you move them it will be much less upsetting to the plant and easier for you to move, too! 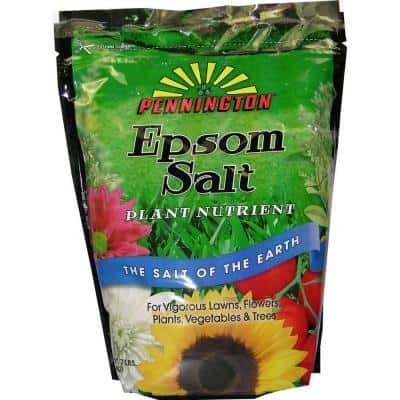 Use Epsom salt to water your plants. 1 tablespoon to a gallon of water does the trick. The magnesium creates strong green leaves and large blooms. You will be amazed with this one – it’s really an amazing plant nutrient! Deadhead flowers regularly. I recommend putting aside 15 minutes every morning or evening to do this. What is deadheading? Deadheading is very simple. As the plants fade out of bloom, pinch or cut off the flower stem below the spent flower and just above the first set of full, healthy leaves. The more you keep up with it, the more constant your blooms will be as the plant will know to produce more flowers. Finally, invest in the correct tools. Whether it’s a new lawnmower, a rake or even just gloves. Make sure you have the tools to do the job properly! 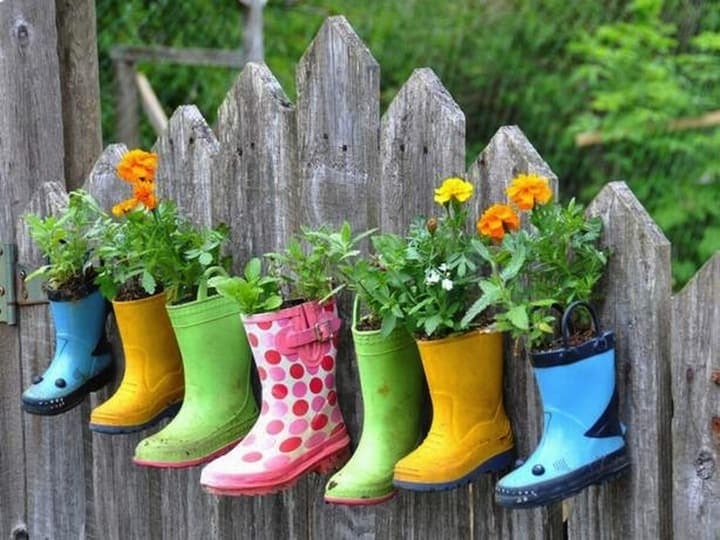 For more gardening and lawn inspiration, check out my Pinterest boards! 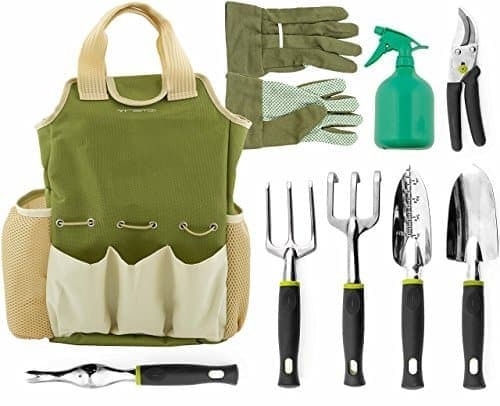 What tips do you have when it comes to gardening and lawn care? I’d love to hear from you! Such amazing tips here! My fiance is a realtor and she always recommends some of these tips to her first time home buying clients. I loved your advice to water your lawn. It sounds so simple, but you’d be surprised how many people forget how important it is. The last thing you want to do is cause unnecessary issues due to something as simple as watering your lawn. 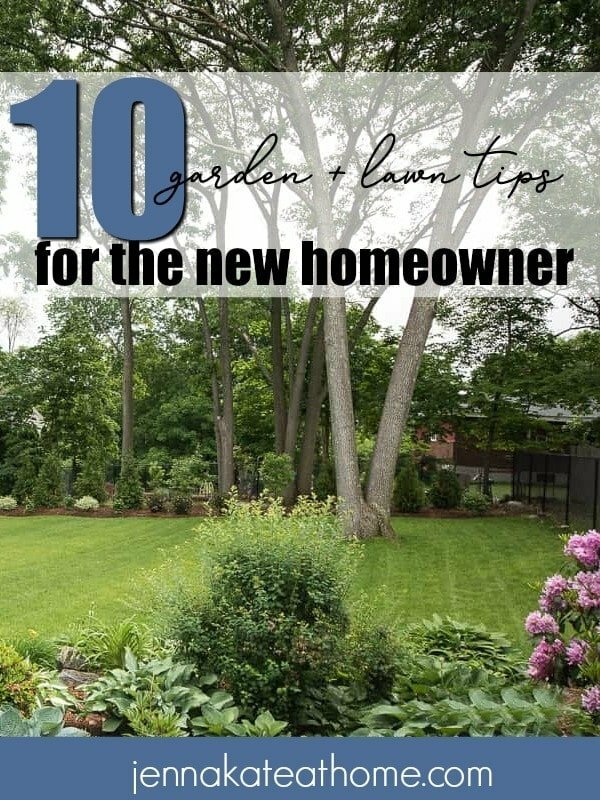 Thanks for recommending some garden and lawn maintenance tips. You make a good point about how important it is to know your hardiness zone. It makes sense that you want to choose plants that will thrive in your area. Hopefully, I can speak with a landscaper about what the best plants for me would be. I had no idea that cutting grass tsoo short could be damaging it. I usually cut it short so I can leave more time in between mowings. I’ll have to stop that so we can get a stronger lawn. Is there a certain amount of time that I should wait between mowings to allow the grass to recover? Thanks a lot Jenna for your innovative ideas! I just love your ideas, this is pretty helpful for me and my wife as well. Once again thanks for sharing with us. Your tip to deadhead flowers regularly was really advantageous. Keeping up on deadheading will enable your garden to constantly grow vibrant flowers like you brought up. Inspecting your other plants while you are in the process of deadheading will help you keep up on other things like weeding. This is very helpful. I have not done well keeping up with my landscaping, but I am hoping to start now. I think that I should plant in containers more, as you mentioned. Do you think it is easier to get plants started when they are in containers? This is some really good information about landscaping. It does seem like a good idea to know the hardiness level of your soil in your area. That seems like it would be useful when it comes to choosing plans. It might also be smart to talk to a professional landscaper if you are having problems in your yard. It would be great to talk to a professional if you have the funds to do so! These are some great tips, and I appreciate your advice to deadhead your flowers regularly to keep them healthy. My husband and I just moved into our first home, so caring for a landscape is something fairly new to both of us. We have a flowerbed out front, so I’ll definitely try to deadhead the plants there regularly to keep them in good condition. Thanks for the great post! My husband and I just moved into a new house and want to plant a garden. Thanks for the advice about knowing your hardiness zone so that you can know what will survive. Hopefully, we can get some help from a landscaper to show us good plants and ways to garden while keeping our yard looking nice. Thanks Sarah and good luck with your new home! Thank you for the help. My wife and I are wanting to focus more efforts on our landscaping this year. Unfortunately, we did not spread new seed over the fall, as you suggested. Could we reseed in the spring or would it be wise to simply wait until next fall?